UNIVERSITY PARK, Pa. — The Thomas D. Larson Pennsylvania Transportation Institute (LTI) today announced that Elizabeth Traut will join the Institute as an assistant research professor. She is scheduled to begin August 15. Traut, who earned her doctorate in mechanical engineering from Carnegie Mellon University (CMU), has spent the past four years working as a National Science Foundation (NSF) Science, Engineering, and Education for Sustainability (SEES) fellow at the University of Glasgow, as well as a post-doctoral researcher at the Robotics Institute at CMU. 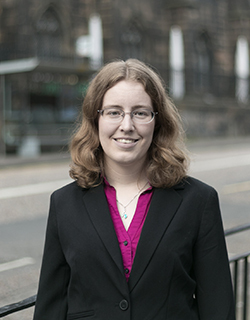 Her research interests include economic and statistical modeling of transportation-related systems, life-cycle assessment, engineering design, data science and optimization. Dr. Elizabeth Traut joins the Larson Transportation Institute as an assistant research professor, effective August 15.